The market bounced more than I had expected and this now opens the option of for an "expanded flat" or a sideways correction. This would be that the uptrend is so strong that the market will correct mostly in time but not in price so we'll have to revisit how to trade this wave. 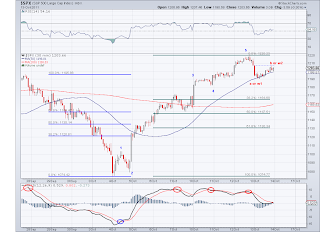 Right now the TA has risen to 1197 and whenever this average catches up with the market, there is usually a price burst which it will be to the upside if we keep trading sideways. 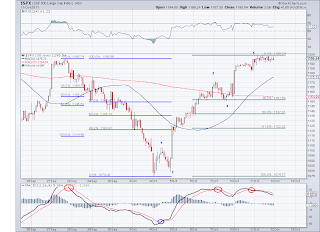 The market closed over the TA and the FTA from yesterday so it ended the day bullish. So I'll be watching how the market trades once it goes under the FTA again and probably use it as a stop as it is getting riskier staying short despite that fact that we are clearly overbought. 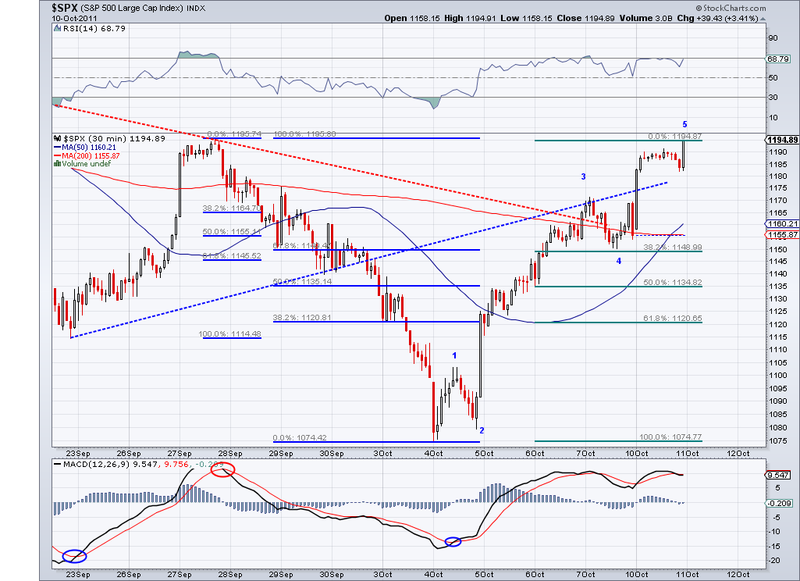 I expect the 1190's level to be revisited again before the market makes up it's mind. 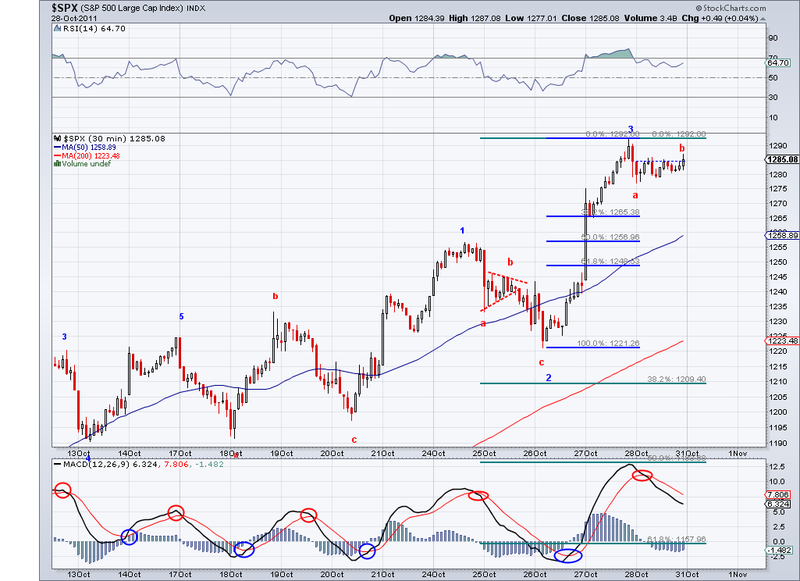 Finally the correction seems to have started so now we can start anticipating at which level the correction will end. 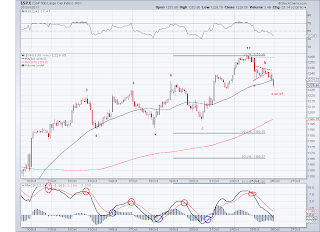 Technically speaking, this wave has the liberty to go all the way down to 1075 and still be considered bullish. 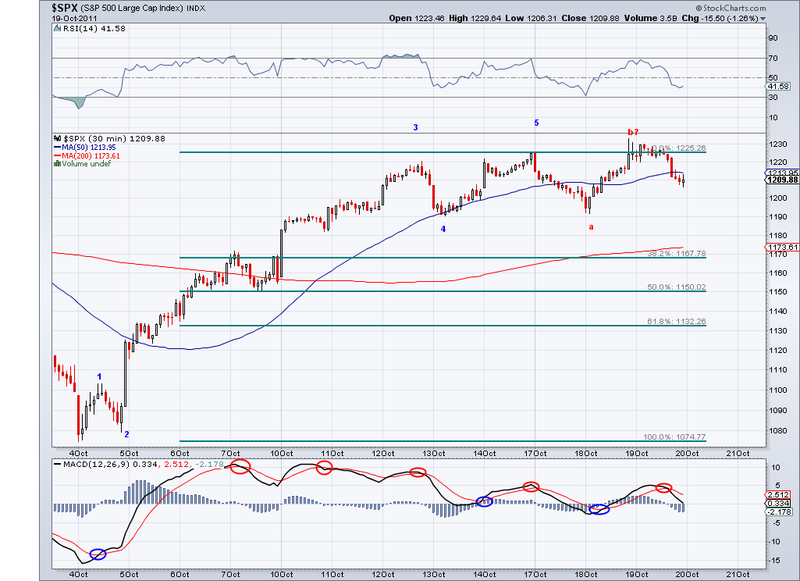 However, the level I am looking to is 1150 as the most probably support level. 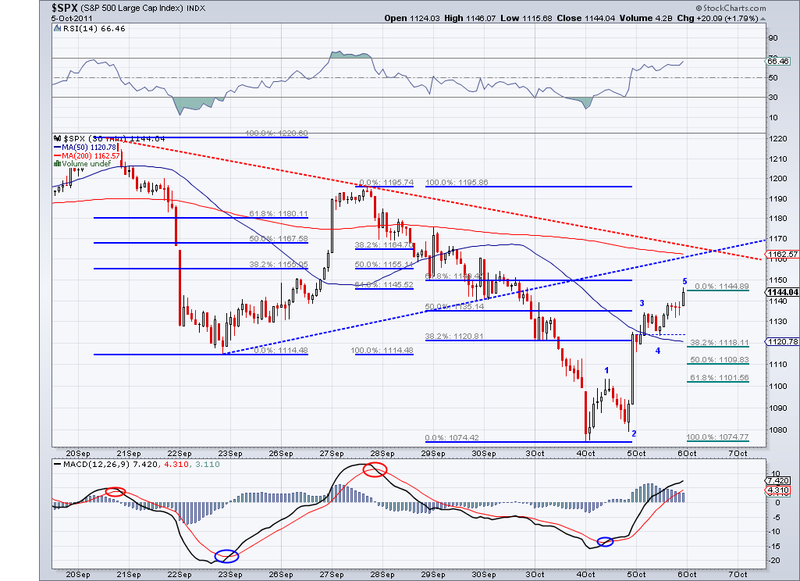 If that doesn't hold then we might get the 1120-1130 level I had originally speculated on. 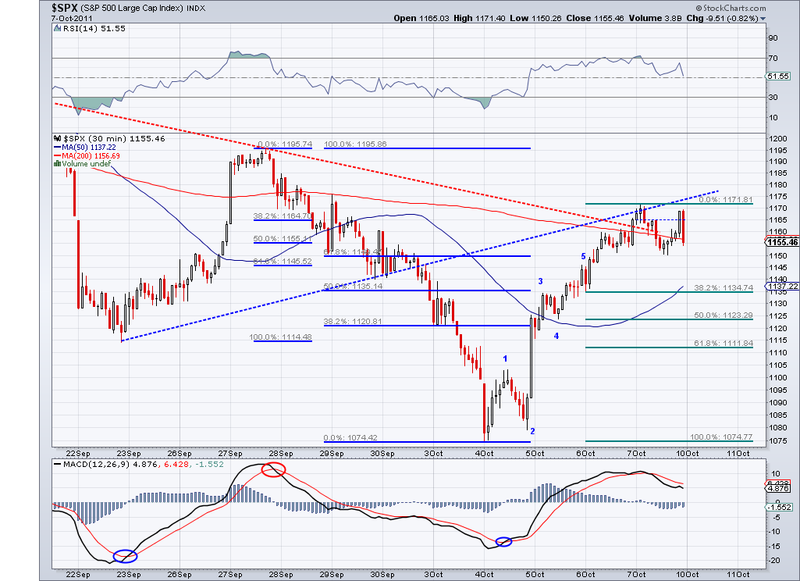 Whatever it is, the market should put in a higher low and put in a huge rally to the 200 day MA and possible 1300. 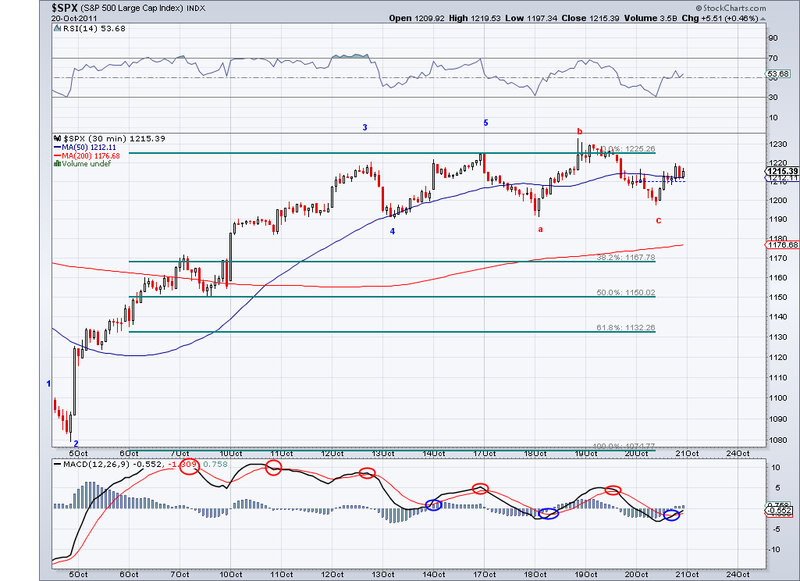 And my strategy will be to cover my 1183 short and then go leveraged long until this target is hit. 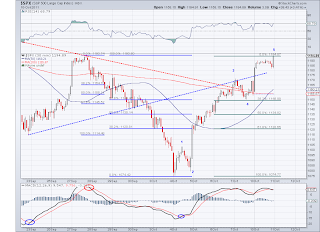 Using of course the TA as my primary guide for positioning in the market. And this next time I am going to test the FTA against the TA to see if I can accurately call the bottom (or come close to it). I believe the TA system has proven itself in the last couple of months as a very strong tool to position oneself in the market. My main challenge has been the timing of market turns, so maybe this is the answer to my long quest in finding a system that works for traders like me. I've been working on this for over two years so maybe this will be it. The FTA 1203 level was broken in after hours so there was no way to trade it and as expected, trading over this level brought new highs to this leg. I have been wrong on the timing of the correction to this rally and as I speculated on Oct 5th, sooner or later I was going to be wrong so now maybe it's time for me to get it right. It's been a strong rally for sure, 150 handles in couple of weeks without a single significant correction. Bullish legs like these are rare but they all come to an end sooner or later and I am predicting the market will turn early next week to the Fib area. One of the indicators I like the most is the one below. Every time you get over 80% of stocks over their 20 day ma, they correct without fail (at least every single time this year). 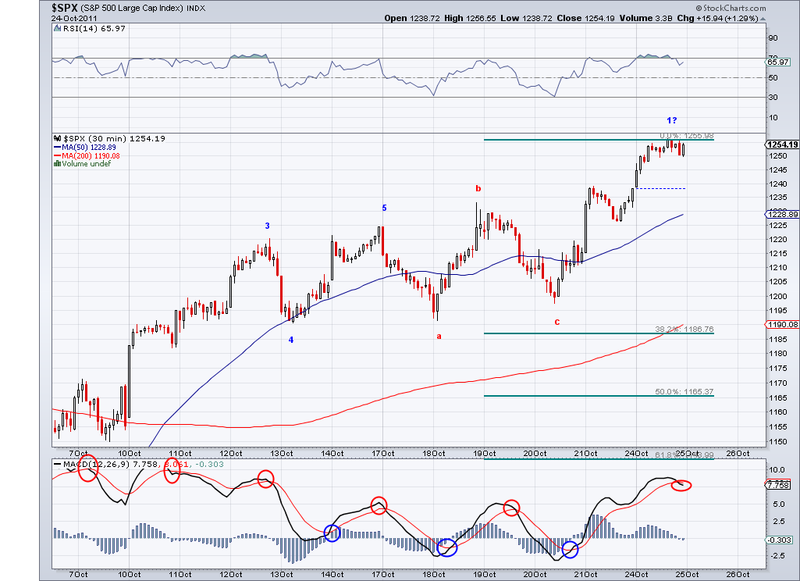 So the question for me now is not really whether stocks will correct, it is to what level. Given the strength of this rally, a correction to the 1150 area is now more likely than the 1120-1130 area I had originally projected. Still can happen obviously but 1150 just looks better at this point and once there we should see a wave that could take us back to 1300.. Fundamentally speaking, the problems that started this summer sell off are still there. So one could look at this rally as a snap back counter rally rather than an actual start of a bull market. Finally, the weekly tracking of the TA system has it at +25.79% vs -8.4% for the SP500.. goes to show trading this mechanically is the best way to go. 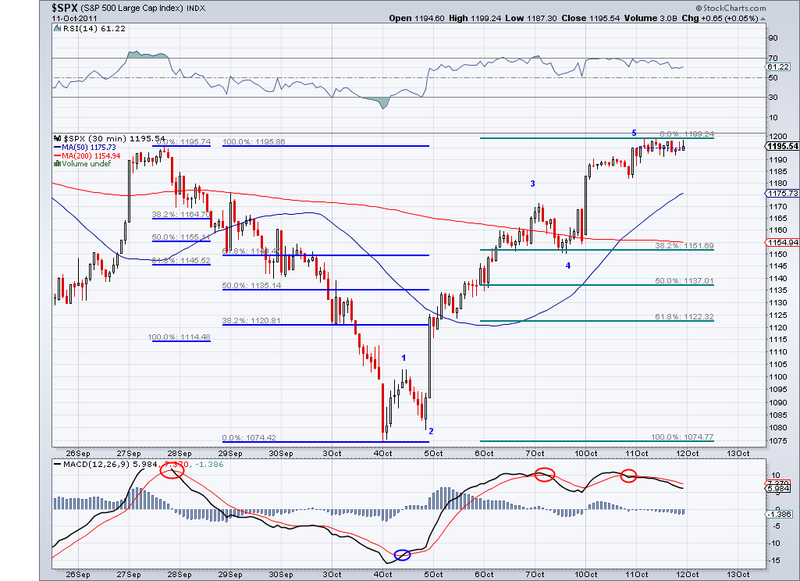 Also, the FTA level to watch Monday for a market correction is 1209. 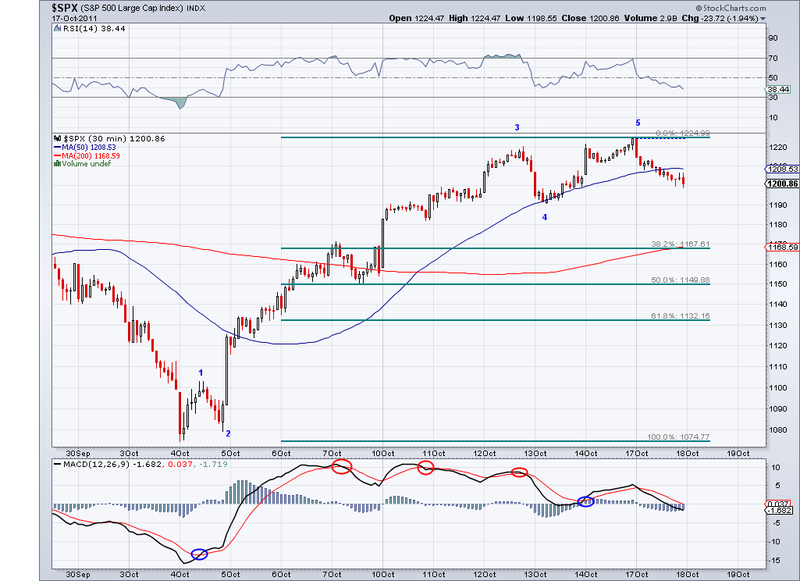 The market needs to trade below this level to confirm a bearish turn. Until then, we might see 1230 being challenged. The market seems to have started the correction so we just need to see how low this will go. 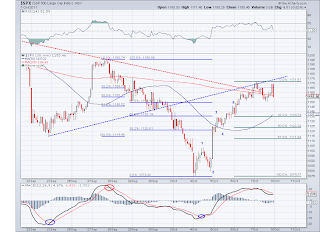 There is however a slim chance for the market to put in another bull leg and reverse ONLY IF the market continues to trade over 1203 for over couple of hours. This is part of the FTA system I am testing, so we'll see how it works out. 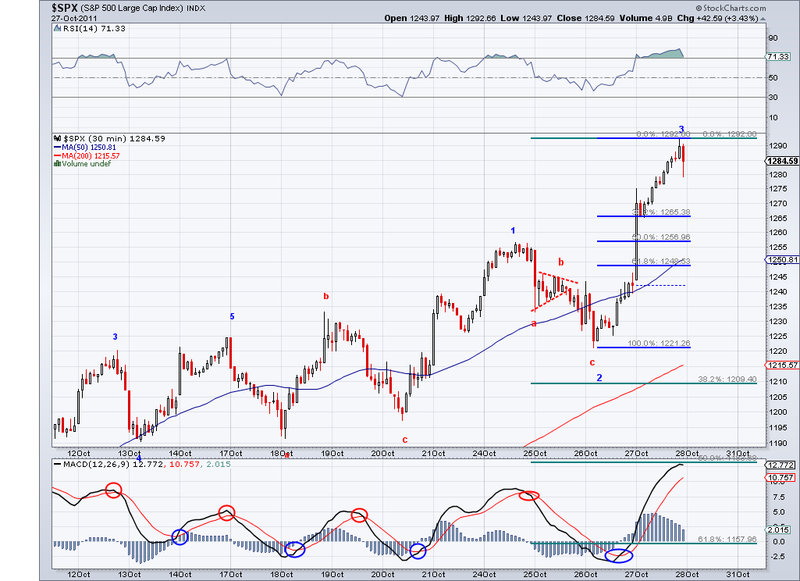 But as for now, I see the market resuming a bearish wave to Fib area and to test the Trend Average. Once there, I'll be looking at the FTA for clues as to how to position trades. As of now, I continue to be short at 1183 and have sold some of my longs as well. The key to maximizing the TA system will be in finding an FTA that works well in conjunction with the trend. As it is, the system works very well trading it mechanically but I think it could be improved by adding a second solid measure and take out the guessing that comes with traditional Technical and Wave analysis. 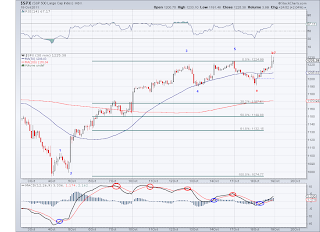 The market managed to put in another bullish leg defying its overbought condition. 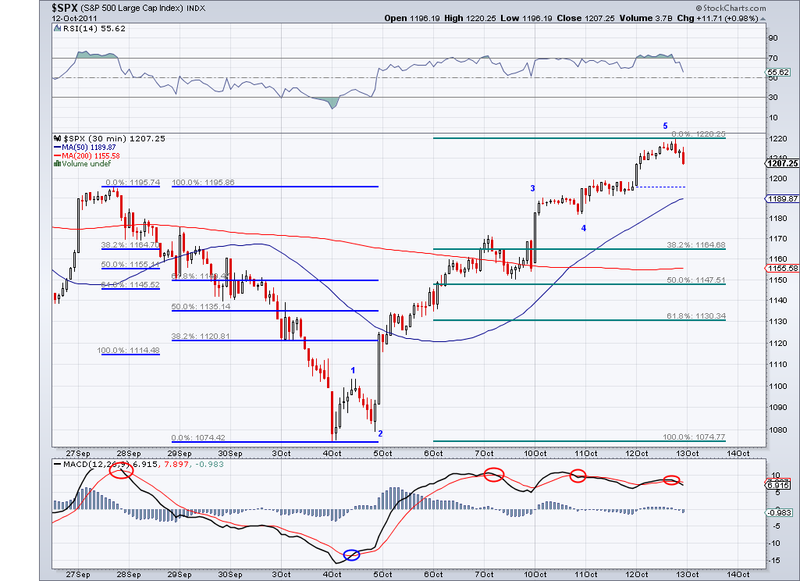 However, like I said yesterday the market is ripe for a correction/sell off at this point. 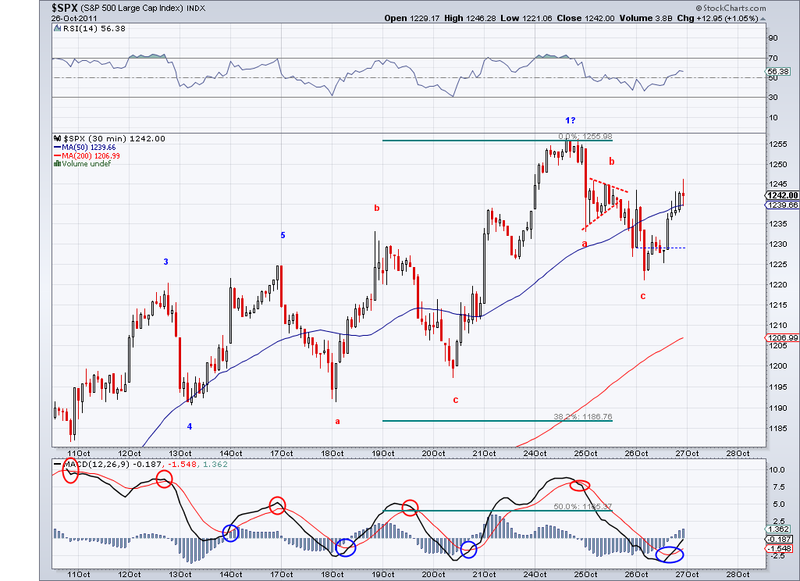 And this leg has gave me an idea of start applying the TA system at the minute/hour level to call tops or bottoms. Obviously, a fast moving average is prone to get whipsawed more often but I think the gains out weight the loses so from today I will be tracking these minute averages as well. For one, I would not have exited my margin long nor hedged when I did had I followed these minute averages. 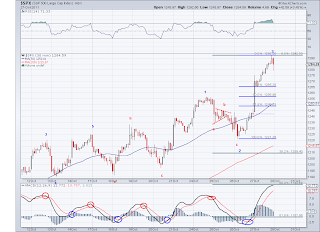 What prompted me to take profit early on were traditional technical analysis tools and the wave structure. But the more I do this, the more I am convinced the answer lies in the average. At 1141, when the signal first gave the buy signal, all indicators were already flashing overbought. But the TA signal has been very right since I first started using it and I am hoping with these faster averages I will have the answer to critical topping and bottoming levels in the market. So from today on I will post the "Fast TA" on the right and the level to watch. As of the close, the FTA signal went bearish at 1215 so market closes on a minute basis lasting longer than 10 minutes will signal a change of the FTA to the bullish side. If the market respect this level, it will signal the top is in. 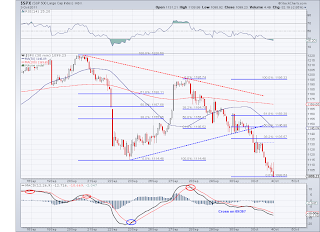 The market did not do much today other than rollover on the MACD that I follow. So I am still expecting the correction to start anytime now. Obviously, we could have more bullish legs to this rally but the market is overbought so the path of least resistance is down at the moment. Market just needs a good excuse to start the correction.. 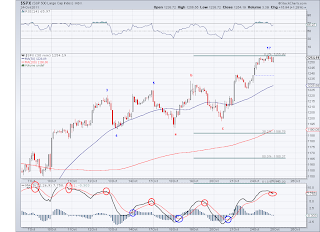 Potential Inverse & Shoulders setting up? So we did get that gap up to 1180's after all as I had been speculating last week and I think we are now at the end or near the end of the 5th leg that started from 1074. And while it is hard to say which level will be the top, it is safe to say that we should get a big correction after this is done. 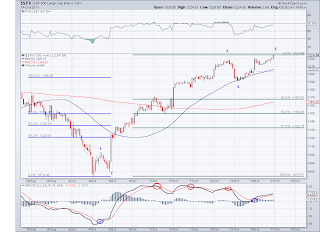 The market is hitting the 1195 resistance and the next hurdle would be 1210 and 1220, so maybe the market might make that far? 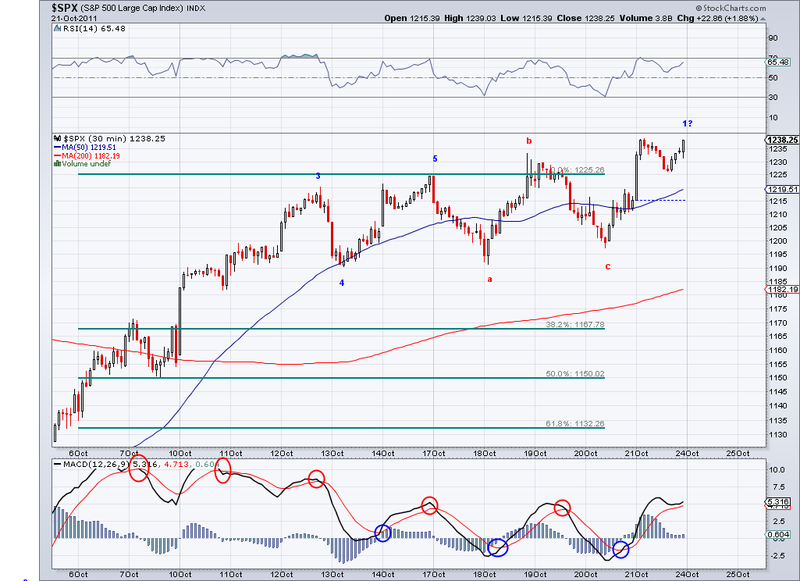 but I executed my plan and went short at 1183 and wait for the correction. 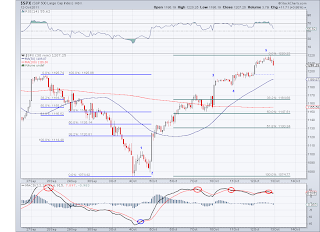 I think one very probable scenario is the market dropping to 1120-1130 and forming the right shoulder of an inverse H&S that could target 1325, so we'll see what the market does the rest of the week. The same people who have been buying recently are going to be selling soon.. works like clockwork. On a side note, I wanted to point out the accuracy of using the TA.. had I not been fearful of a correction I would be up 7% today on my margin instead of the 1.5% I ended up with. These TA numbers it seems, trumps all.. The correction seems to have started on Friday. 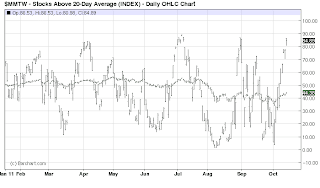 However, I didn't see the gap I was hoping for and instead we saw a spike during trading hours. So I still see a possibility for a gap to 1180 before heading down on Monday but if we gap down then the correction will be confirmed and the market should be crossing the TA early next week to the downside. If the top holds, I see 1120's as good place for a bounce but since this is a W2 this could go all the way down to 1075 and still be valid. 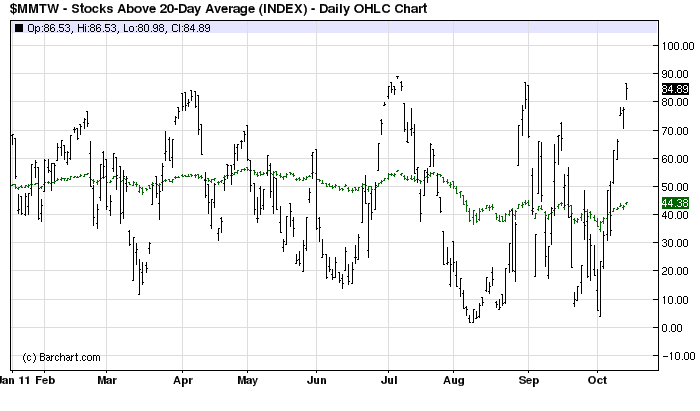 Given the volatility in the market, I'd be surprised if the market behaves as expected. I am still hedged and will only go short if we get that gap, otherwise I'll short it at the break of the TA on Monday or Tuesday..
As of this week, the trading system is up 21.3% since July 28th 2011 vs -15% for the S&P 500. 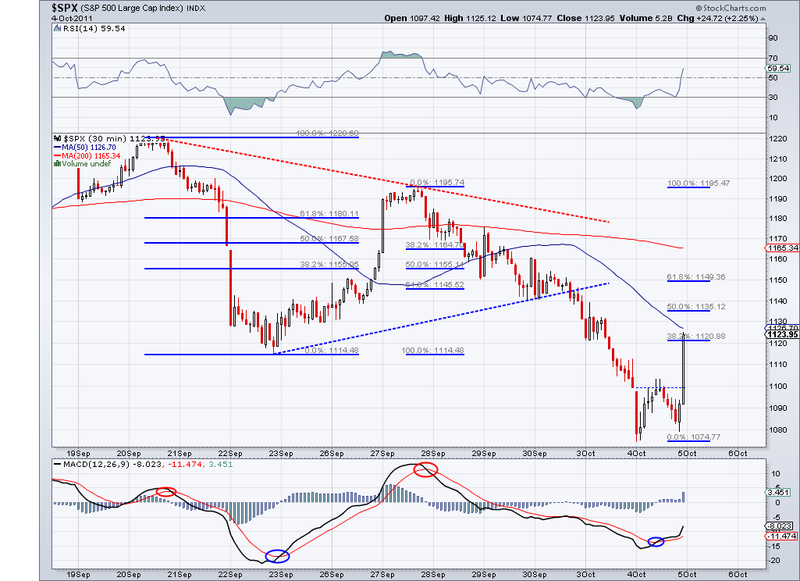 The TA has confirmed a bullish trend today and the market hit the trendline I drew yesterday. 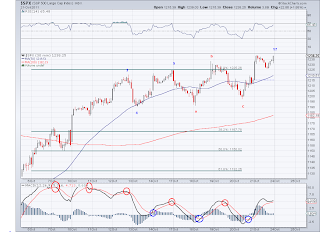 I am however being careful with longs right now and rather load up on the pullback. 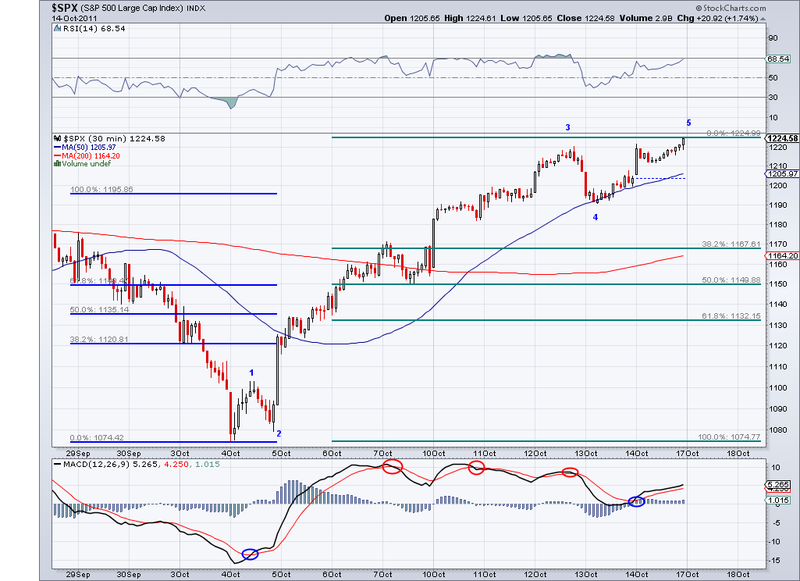 As it is, I expect a correction now to at least 1120-1130 to test support at that level before resuming the uptrend. It's funny to see all those people who were panicking just few days ago are now desperate to buy.. 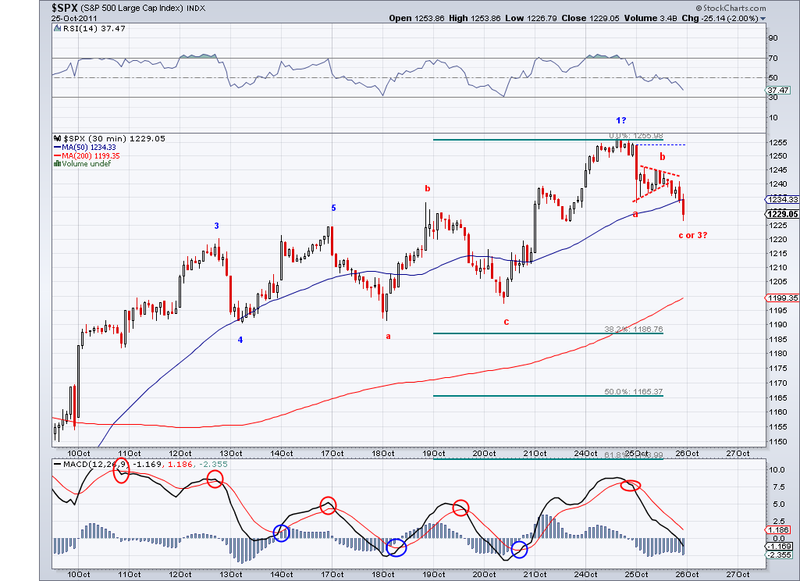 I am still waiting for either 1180 (if we see a last up wave it should end at 1183-1186) or the break of the TA to possibly go short. I went 100% hedged today at 1156 so just waiting for the correction to come. Also, despite the fact that I think the bottom was at 1074, I still see a minor possibility to see a huge bearish wave to 1040 to wash out all the weak longs. 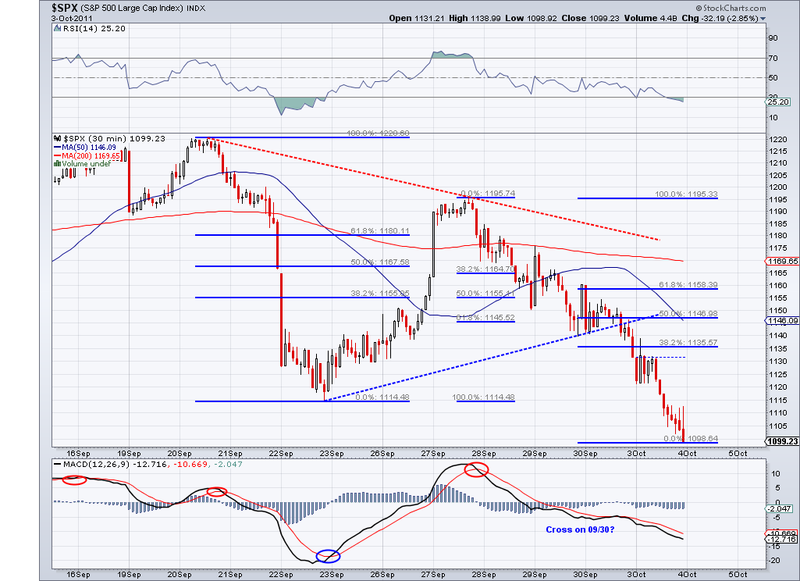 But if the 1100-1120 support holds, that possibility can be eliminated. And btw, how about those Wall Street occupiers? they remind me of people who send emails to boycott gas stations for a day to bring down the price of gas.. The market met the TA as I had been expecting and closed barely above it, starting what should be a change of the short term trend (I have been very right lately and that usually means I will be wrong soon, so let's see how long I can keep the streak going).. 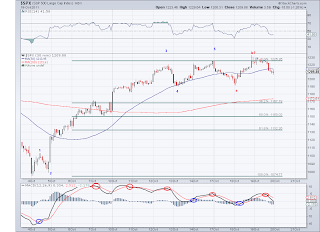 However, we need more closes above the TA to confirm and from the way the wave from 1074 looks, it is due for a correction in the next couple of sessions. 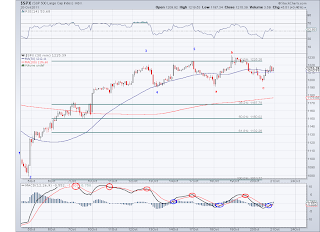 So I am expecting a pullback to the 1110 area at this point. 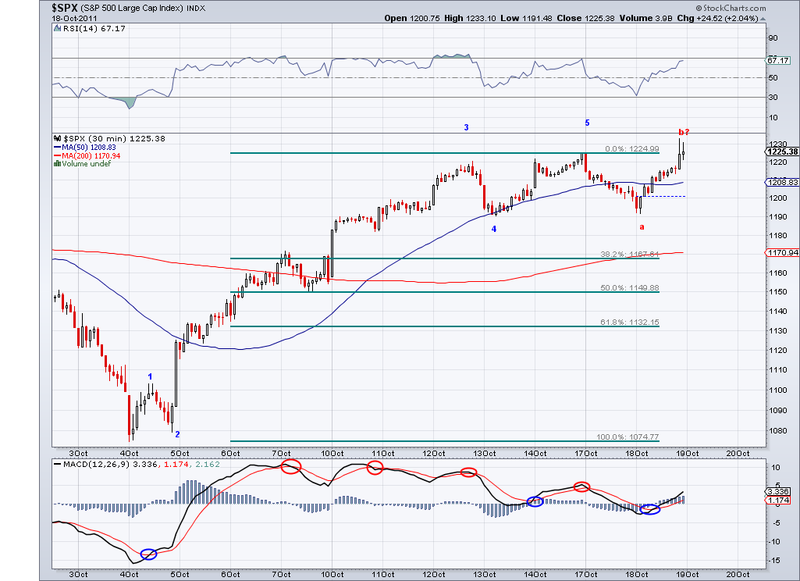 And should the market continue to rally, I see 1180 as a level to go short if the market does not pullback. I sold my margin long position at 1133 and then I hedged 80% of my core longs at 1141. 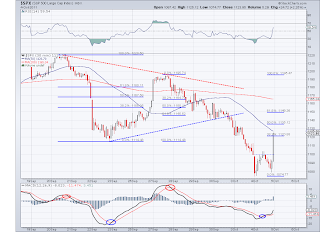 Also, another possibility is the market hitting the trendlines on the chart. Whatever it is, this seems at the moment like the beginning of a rally to the 1250. Last but not least, may Steve Jobs RIP. A man with his vision usually comes only once a century. So the market rebounded.. 4%+ in the last 40 minutes. 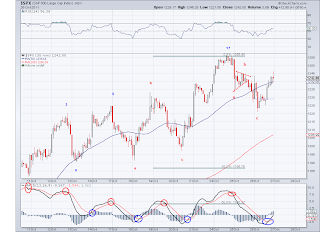 And that potential bearish leg to the 1060-1080 area I was speculating about yesterday materialized so I think the bottom for the bearish wave from 1370 is officially in. 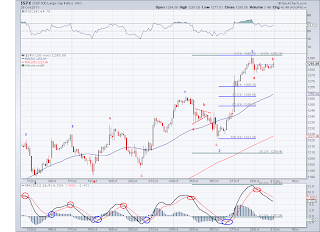 I am looking for a retracement rally back to the 1200-1250 area in several weeks time. I am sure the EU will find some sort of solution to the crisis and things will seem good enough to rally back to that area. However, as long as the market remains under the 200 day ma, we are in a bearish market. My longs are intact and I will be selling at oversold conditions and using the TA as a guide, which has worked great in the past couple of months. 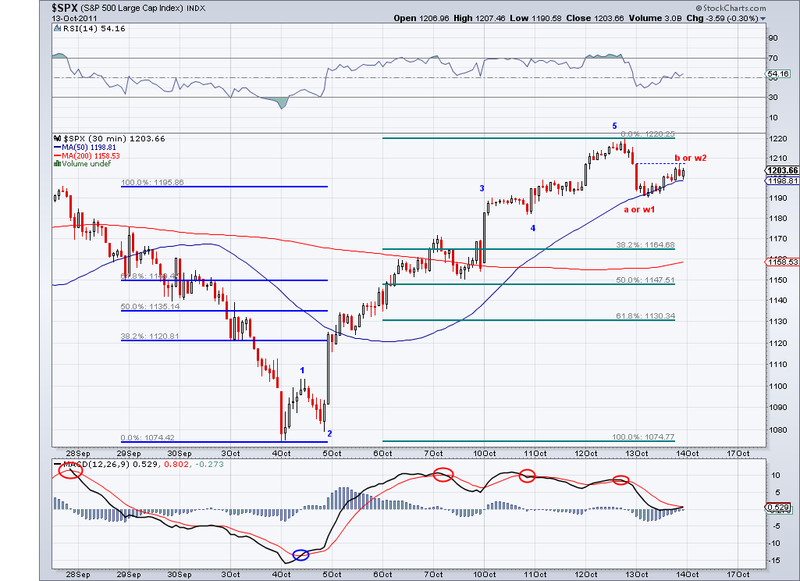 The TA is currently at 1141 so maybe we'll get there in a session or two. 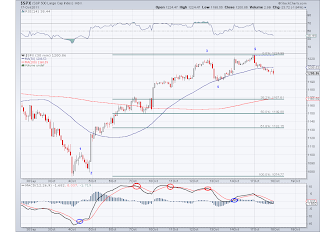 The market met the 1101 target I had few weeks ago and tomorrow we should start a bounce from these oversold conditions. There might be another low that will come in the 1060-1080 area so this is probably not done yet. I personally think the market is a bit too bearish and any resolution to the EU debt problem will spark a huge a rally.. but for now, it's all about getting the most out of this volatility. 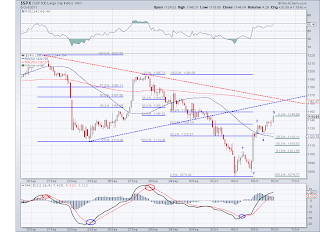 I went long on margin at 1117 and expect the market to at least meet the TA currently at 1146.